First thing I have to say is that I “read” the audiobook of this novel. And the second thing is that I jumped ahead a couple books when I saw my library had the audiobook. I liked this book. Of course, I am a big Terry Brooks fan, and I have liked (not necessarily loved) all of his work. In this, the first of the Dark Legacy trilogy, the Four Lands are at something of a crossroads. Magic is falling into disfavor, with the Druids being druids and guarding their magic and its secrets quite closely, and the newly resurrected scienctific factions rising. An Elven druid, Aphenglow, has been researching the elven archives at Aborlon, looking for clues to lost magics. She finds a diary, apparently written by an Elven girl who fell in love with a Darkling boy. The diary suggests that the multi-colored elfstones of legend do exist and hints at where they might be found. And that sets us off on this story’s quest. Yes, it is another quest story, as are all of the Shannara books. It does borrow much of the formula from past books, but there are intriguing bits as well. There is more political maneuvering going on here, with the humans and their new Prime Minister an active part. We see the return of the Ohmsfords, the Leah, and the Elessedil families, tied together and all necessary to the resolution of the quest. The defense of Paranor, the Druid stronghold, is quite nicely done. 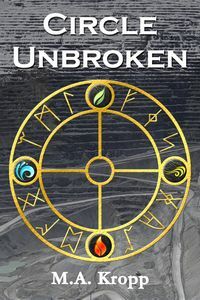 And there is loss, heartbreak, danger, monsters, and, most of all, the struggle to fit the various inhabitants of the Four Lands together in a newly developing world. The book is narrated by Rosalyn Landor, an English actress. She does a good job of voicing most of the characters, although some of the males tend to sound a lot alike. I think she can be forgiven for that. All in all, it is easy to listen to. Is it a great book? No, it isn’t. Is it a good story? Yes, most definitely. If you are a fan of Brooks and Shannara, you will most likely enjoy this one, too. Thank you! I am glad you enjoy the posts.